Many people are disappointed to find that rabbits rarely enjoy being cuddled or picked up routinely. Most rabbits can be taught to accept routine handling, but there is nothing wrong with a rabbit that prefers to sit beside you rather than in your lap. Remember that rabbits are a prey species and that a "friendly restraint" is difficult to distinguish from being captured by a PREDATOR. It is easier to pick up a rabbit that trusts you. You can earn a rabbit's trust with patience and by letting him approach you without grabbing him. Rabbits can sense if you are confident or not and will fuss and wiggle if you hesitate or seem unsure of yourself when you try to pick them up. If you do attempt to lift your rabbit, make sure that you support both the front and the back end. It's important to support their back legs by placing one arm behind their rump and prevent them from hopping away from you and injuring themselves by placing the other arm in the front of the rabbit. 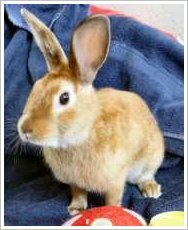 Squeezing a rabbit can be terrifying to them and will cause them to thrash and kick in a panic. Your hands should be used to support the rabbit. Never lift a rabbit by the ears or scruff of the neck and never let a small child pick up a rabbit. Frightened rabbits will bite, kick or scratch. This will cause injury both the child and the rabbit. Many rabbits sustain fractures or become paralyzed from being dropped by children. If you ever feel that you are loosing grip of the rabbit, crouch down quickly and release your hold.